Offa’s Dyke Path.work Walking RouteOffa’s Dyke Path allows you to step back into the past for 177 miles along the Welsh border. Discover Britain’s longest archaeological monument – the 8th century Offa’s Dyke earthwork. Offa’s Dyke offers a challenge many can’t refuse! Hike it in 12 days, run it in five, or take your time and tick off a stage every now and then! Follow the English/Welsh border for 177 miles through dramatic landscapes and make the most of the amazing opportunities to catch views of our native wildlife. 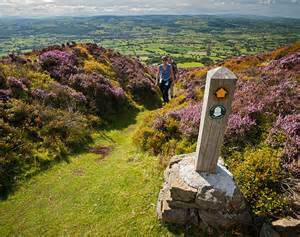 Offa’s Dyke Path allows you to step back into the past for 177 miles along the Welsh border. Discover Britain’s longest archaeological monument – the 8th century Offa’s Dyke earthwork. Will you agree with Lonely Planet that Offa’s Dyke is amongst the world’s greatest walks?